Are we seeing the dawning of Pacific century? And what can its past teach us about its future? We talk with two authors today that feature the Pacific Ocean: first, Simon Winchester talks about his award-winning book, Pacific. Then we talk with Pamela Rotner Sakamoto about Midnight in Broad Daylight. It’s the true story of a Japanese-American family sundered by the Pacific Ocean during World War II. In 2011, Simon Winchester came out with his book Atlantic. It was a look back at the history of an ocean that has in many way defined the rise of western civilization. Last year, Winchester came out with a companion book for ocean loving readers — Pacific. But this book looks forward, examining the shift in the geopolitical axis of the globe toward the lands that rim its greatest ocean. Winchester examines ten signal events. They include, among others, the detonation of the atom bomb tests in the South Pacific, how climate change is threatening ocean species, North Korea’s development of nuclear weapons and how new technology is opening up the ocean floor to exploitation. Simon Winchester is the bestselling author of 12 books of nonfiction, including Krakatoa, The Professor and the Madman and A Crack in the Edge of the World, which we spoke to him about in 2007. 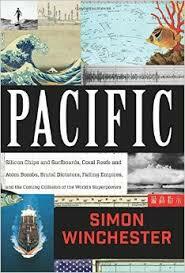 Pacific was a finalist for the Kirkus Prize for Nonfiction. When historian Pamela Rotner Sakamoto was working on her dissertation in Japan, she stumbled on a story so remarkable, she vowed to write it when her dissertation was finished. The story is about Harry Fukuhara, a Japanese-American decorated hero of World War II, and his family, who were divided by that war on both sides of the Pacific. The family was from Hiroshima, a tragic twist of fate that resulted in Harry’s older brother Victor dying from radiation sickness after the US dropped the atom bomb. Harry was in the U.S. when Japan attacked Pearl Harbor. Like so many others, he and his sister were interned under terrible conditions in FDR’s relocation camps . But then Harry became an interpreter with U.S. intelligence in the Pacific theater. After the war, he worked for the U.S. occupation forces in Japan — where he reunited with his mother and other brothers. 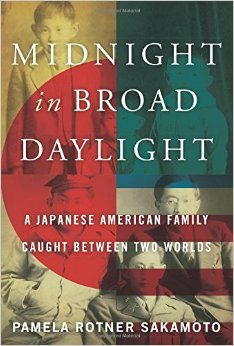 Sakamoto’s book, Midnight in Broad Daylight, tells how the Fukuhara family came to America, what they found there, why some of them returned to their ancestral home in Japan and how the war first divided and then united them. Pamela Rotner Sakamoto is an American historian. Fluent in Japanese, she lived in Kyoto and Tokyo for seventeen years. She now lives and teaches in Hawaii.